The Russian ambassador to Lebanon said that Putin and the Russian chief of staff had decided on military backing for Syria against a possible US attack: “If they attack, the missiles will be intercepted and the launching sites will be hit…Every American missile fired at Syria will be dropped.” This was reported Wednesday morning on Hezbollah’s Al-Manar network. Some indications are that an attack will come in the next day or two, others suggest that it will happen over the weekend. On Tuesday Eurocontrol, which is the European Air Traffic Control agency has told airlines to exercise caution in the eastern Mediterranean over fears that air strikes could hit Syria in the next 72 hours. US Defense Secretary General Mattis was to travel to California over the weekend, a trip that he canceled, but he has not canceled an engagement in New York on Friday, which raises the possibility something will be happening over the weekend. The USS Donald Cook, a Navy destroyer, left a port in Larnaca, Cyprus on Monday. The guided-missile destroyer is armed with Tomahawk cruise missiles, which were used a year ago after an alleged sarin gas attack on Syrian civilians. The word is when/if it happens this attack will be a much harsher attack than the 59 Tomahawk missiles used against Syria a year ago. That attack hurt Syria but not enough to make they stop. 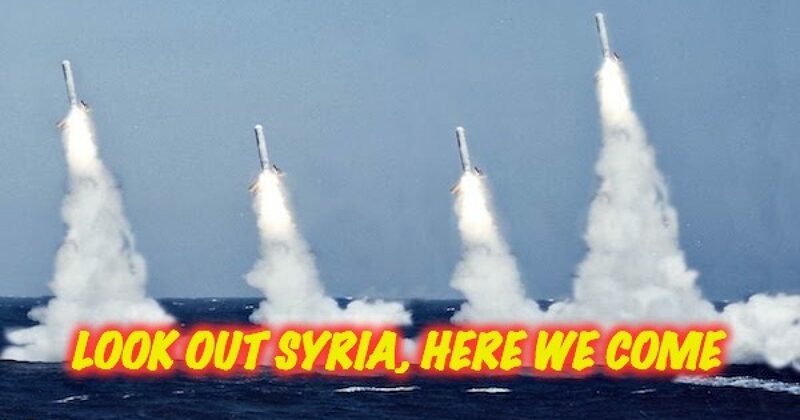 Some military experts predict that this time the entire Syrian air force will be destroyed, but that’s doubtful as many of those planes have been moved to Russian bases in Syria and we don’t want to intentionally bomb Russia. But make no mistakes last year’s strike was meant to send a message–but the message wasn’t received so a new attack will destroy major Syrian assets. For those who are calling for an intentional attack on Assad that would be illegal as U.S. law forbids an intentional assassination of another country’s leader. Rumored participation by France, and possibly other allies such as the U.K. or even the Saudis not only would provide greater legitimacy for a large operation that will be positioned as a humanitarian mandate but would also provide the materials needed for a larger attack. French President Emmanuel Macron indicated on Tuesday he believes Syria used chemical weapons in violation of United Nations resolutions and that a decision on how to respond would come from France and its allies, particularly the U.S. and the U.K., “in the coming days.” Macron said any attack would be aimed at the regime’s chemical “capabilities” and not at its Iranian and Russian allies. Look, sending American heroes into danger is never a good thing, but we cannot tolerate the use of WMDs anytime, but especially when they are being used against civilians. By all indications, despite the Russian warning (which seem more like bloviating than an actual threat notice it came from a diplomat rather than Putin) Syria is about to be hit soon by a U.S. coalition and hit hard. And BTW there is no truth to the rumor that if we do attack Syria, Rep. Adam Schiff (D-CA) will claim the attack on Syria was made to distract from the Mueller investigation, and the Russian threat was made just to cover up the Russia/ Trump relationship. Although it does seem wacko enough to come from Adam Schiff. Satellite photos of Russian naval base in Tartus, Syria show all 11 Russian battle ships have left Syria. Perhaps to avoid being sitting ducks as rhetoric between Trump and Russia escalates.